This powerful solar flare was spotted on Dec. 5, 2006, erupting from the sun's eastern limb (left side). Asurprising solar flare sent a stream of pure hydrogen at Earth. "We'vedetected a stream of perfectly intact hydrogen atoms shooting out of an X-classsolar flare," said researcher Richard Mewaldt of Caltech. "If we canunderstand how these atoms were produced, we'll be that much closer tounderstanding solar flares." The eventoccurred on Dec. 5, 2006, when a large sunspot rounded the sun's eastern limband with little warning it exploded. On the "Richter scale" offlares, which ranks X1 as a big event, the blast registered X9, making it oneof the strongest flares over the past 30 years. Such aferocious blast usually produces a blizzardof high-energy particles dangerous to both satellites and astronauts. Butan hour later, when NASA?s twin Solar Terrestrial Relations Observatory (STEREO)spacecraft detected the particles, they were of an unexpected type. "Itwas a burst of hydrogen atoms," Mewaldt said. "No other elements werepresent, not even helium (the sun's second-most abundant atomic species). Purehydrogen streamed past the spacecraft for a full 90 minutes." Next came30 minutes of quiet. Then a second wave of particles enveloped the STEREOspacecraft. 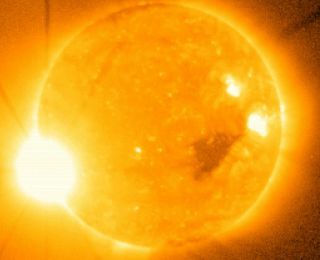 The astronomers said these particles were the ions typicallyproduced by solar flares, including protons and heavier ions, such as ions ofhelium, oxygen and iron. So how didhydrogen atoms survive the energy blast of asolar flare, which packs a punch equal to a hundred million hydrogen bombs?Turns out, the hydrogen atoms weren't so hardy. The researchers think the atomswere obliterated, beginning their journey toward Earth in pieces, as protonsand electrons. "Beforethey escaped the sun's atmosphere, however, some of the protons captured anelectron, forming intact hydrogen atoms," Mewaldt said. "The atomsleft the sun in a fast, straight shot before they could be broken apart again." Sincehydrogen atoms are electrically neutral, this hydrogen stream would have shotstraight out of the sun without any interference from the sun's magneticfields. That wasn't the case for the ions, which did show a delay, not beingdetected for a half hour or so after the hydrogen burst. "Ionsare electrically charged and they feel the sun?s magnetic field. Solarmagnetism deflects ions and slows their progress to Earth," Mewaldt said,adding, "The hydrogen atoms reached Earth almost two hours before the ions." Mewaldt saidthat all strong flares might emit hydrogen bursts, but scientists just haven'tnoticed them before now. Thediscovery will be detailed in a forthcoming issue of the AstrophysicalJournal Letters.